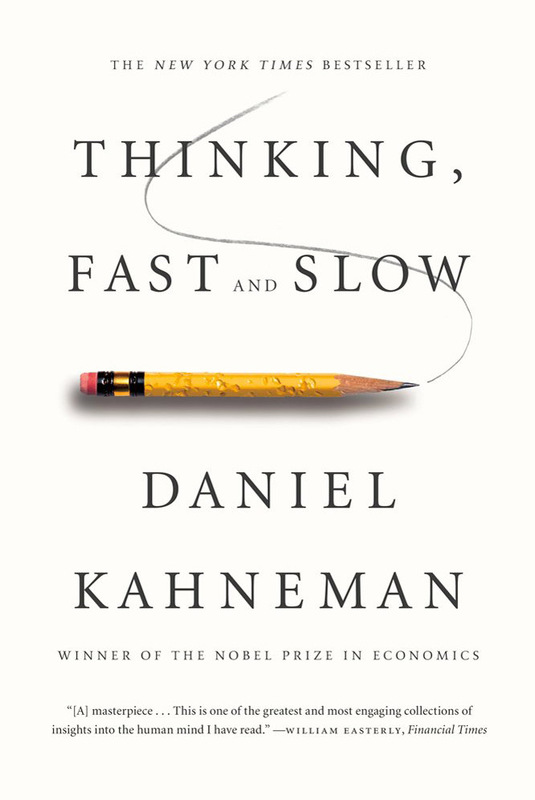 This is a great book that dives very deeply into understanding the systems of our cognition and decision making. It illuminates many biases and explains how many irrational behaviors exist. One of the main ideas of the book is we divide our cognition into two systems, one is fast, intuitive, automatic, but often riddled with biases. The second is more slow, thoughtful, deliberate, and effortful. When I’ve posted controversial subjects on Facebook and received argumentative responses, they are usually from people responding with “intuitive heuristics” meaning they substitute the difficult issue or question with an easier one. A classic example is discussing gun control, and one response is ‘I like guns and I don’t want the government taking them.’ They respond to a complex issue by answering an easier question that is usually irrelevant to the actual discussion. This book helped explain these interactions and made me more aware of my own systems of thinking and flaws. A reliable way to make people believe falsehoods is frequent repetition, because familiarity is not easily distinguished from truth. People tend to asses the relative importance of issues by the ease with which they are retrieved from memory – and this is largely determined by the extent of coverage in the media. If you have had to force yourself to do something, you are less willing or less able to exert self-control when the next challenge comes around. The phenomenon has been named ego depletion… participants who are instructed to stifle their emotional reaction to an emotionally charged film will later perform poorly on a test of physical stamina. With the growing concern over Islam and it’s connection to terrorist acts, I wanted to try and educate myself a little more to the ideas surrounding these topics. This book was a good introduction, but it was basically a conversation between two people, so that had it’s benefits and deficiencies. I look forward to jumping in a little deeper if I find the time with the mounting pile of books I’m trying to read. 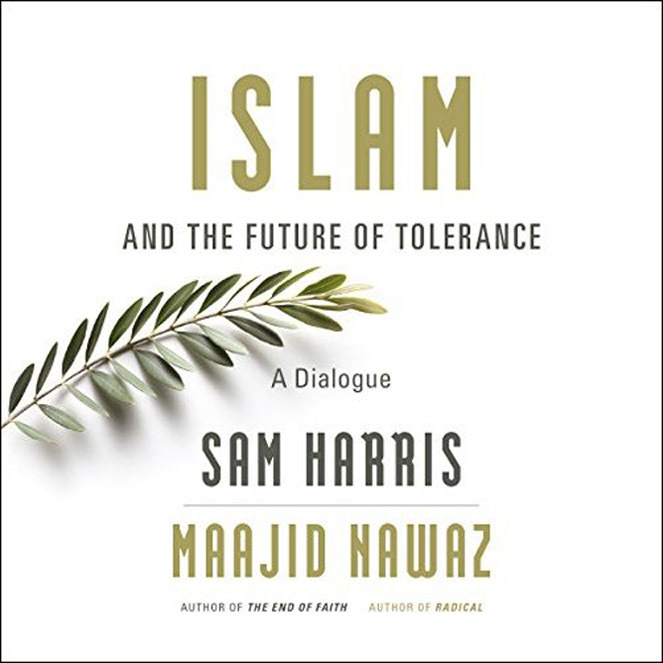 One of the interlocutors is a former Islam ideologue turned moderate Muslim who is trying to create a reformation in Islam, so he has some interesting perspectives. People often blame poverty or a lack of education for radicalization, whereas experts have long known that a disproportionate number of terrorists come from highly educated backgrounds. A more recent poll indicates that 27 percent of Britain’s Muslims said that they had some sympathy for the motives behind the Charlie Hebdo attacks in Paris. We have extremists playing both sides of the board in a clash of civilizations, and liberals won’t speak sensibly about what’s happening. If you only read one book this year, read this book. Since having cancer I’ve made it a point to try and educate myself further, you must be your own advocate for your health! For me it was a life and death situation, I knew something was wrong with my body and had to convince my general physician of it! Turns out it was cancer. Now I educate myself on the latest research to keep cancer away. Three years and counting. 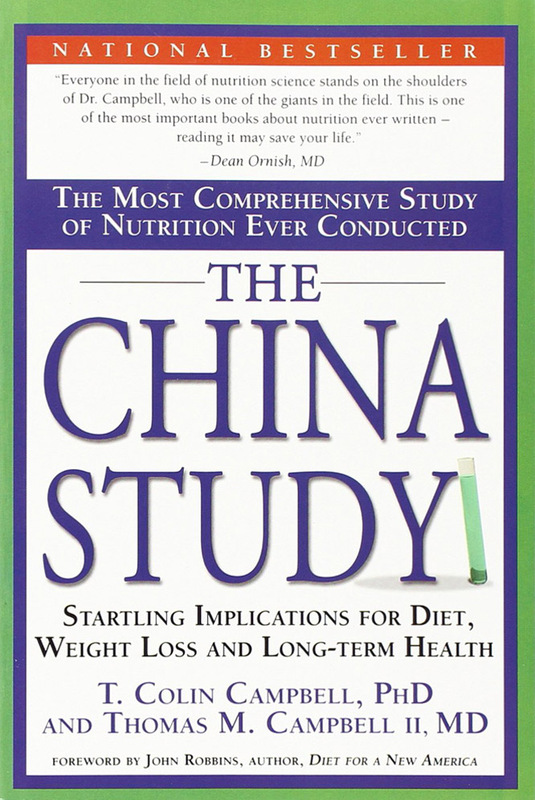 First, Cowspiracy pushed me to dabble into plant-based eating for environmental reasons and now reading The China Study has pushed me to become strictly plant-based. If you don’t have time to read this book, watch Forks Over Knives, or just take 5 minutes to read these excerpts below. The author is a tenured professor of Cornell with decades of research experience, 300+ published peer reviewed articles. …physician error, medication error and adverse events from drugs or surgery kill 225,400 people per year. That makes our health care system the third leading cause of death in the US, behind only cancer and heart disease. The concept of quality really means the efficiency with which food proteins are used to promote growth. This would be well and good if the greatest efficiency equaled the greatest health, but it doesn’t, and that’s why the terms efficiency and quality are misleading. There is a mountain of compelling research showing that “low quality” plant protein, which allows for slow but steady synthesis of new proteins, is the healthiest type of protein. We now know that through enormously complex metabolic systems, the human body can derive all the essential amino acids from the natural variety of plant proteins we encounter every day. Fruits, vegetables, and whole grains are the healthiest foods you can consume, and they are primarily made of carbohydrates. Unfortunately, most Americans consume voluminous amounts of simple, refined carbohydrates [white bread, chips, candy bars, soft drinks, etc.] and paltry amounts of complex carbohydrates [apple, zucchini, brown rice, etc.]. 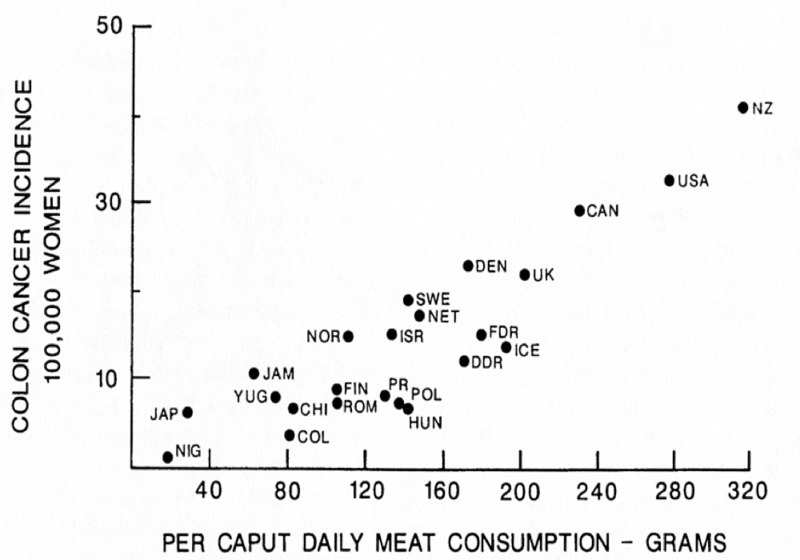 This is bad news, and this, in large measure, is why carbohydrates as a whole have gotten such a bad rap. Notice that a strict vegetarian diet is not necessarily the same thing as a whole foods, plant-based diet. Some people become vegetarian only to replace meat with dairy food, added oils and refined carbohydrates… I refer to these people as “junk-food vegetarians” because they are not consuming a nutritious diet. These studies document the fact that vegetarians consume the same amount or even significantly more calories than their meat-eating counterparts, and yet are still slimmer. One factor I’ve mentioned previously is the process of thermogenesis, which refers to our production of body heat during metabolism. Vegetarians have been observed to have a slightly higher rate of metabolism during rest, meaning they burn up slightly more of their ingested calories as body heat rather than depositing them as body fat. But after just three weeks [of a veggie diet], the Type 1 diabetic patients were able to lower their insulin medication by an average of 40%! Of the twenty-five Type 2 patients, twenty-four were able to discontinue their insulin medication! This process [developing Type 1 diabetes] boils down to a truly remarkable statement: cow’s milk may cause one of the most devastating diseases that can befall a child. Cow’s milk consumption by children zero to fourteen years of age in twelve countries shows an almost perfect correlation with Type 1 diabetes. The greater the consumption of cow’s milk, the greater the prevalence of Type 1 diabetes. Dairy intake is “one of the most consistent dietary predictors for prostate cancer in the published literature,” and those who consume the most dairy have double to quadruple the risk. Authored in 1992 by researchers at Yale University School of Medicine, the report summarized data on protein intake and fracture rates taken from 34 separate surveys in 16 countries that were published in 29 peer-reviewed research publications. All the subjects in these surveys were women 50 years and older. 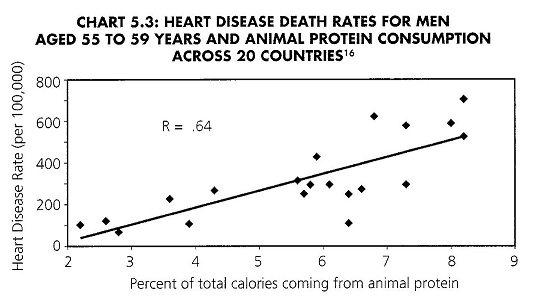 It found that a very impressive 70% of the fracture rate was attributable to the consumption of animal protein. These researchers explained that animal protein, unlike plant protein, increases the acid load in the body… In order to neutralize the acid, the body uses calcium, which acts as a very effective base. This calcium, however, must come from somewhere. It ends up being pulled from the bones, and the calcium loss weakens them, putting them at greater risk for fracture. Americans consume more cow’s milk and its products per person than most populations in the world. So Americans should have wonderfully strong bones, right? Unfortunately not. A recent study showed that American women aged fifty and older have one of the highest rates of hip fractures in the world. Researchers found that a higher intake of total cartenoids was associated with a lower frequency of macular degeneration. Cartenoids are a group of antioxidants found in the colored parts of fruits and vegetables. When all was said and done, this study found that macular degeneration risk could be reduced by as much as 88%, simply by eating the right foods. In confirming these experimental animal results, a study of more than 5,000 people found that greater dietary fat and cholesterol intake tended to increase the risk of Alzheimer’s disease specifically, and all dementia in general. In another study on Alzheimer’s, the risk of getting the disease was 3.3 times greater among people whose blood folic acid (only derived from eating plants) levels were in the lowest one-third range and 4.5 times greater when blood homocysteine (derived from eating animals) levels were in the highest one-third. In other words, the combination of a diet high in animal-based foods and low in plant-based foods raises the risk of Alzheimer’s disease.